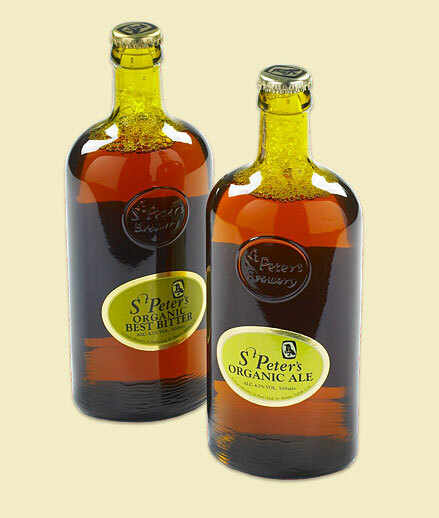 St. Peter's Organic English Ale (4.5%): Look: Again very clear amber color like Golden Ale but a little darker. Very thin head disappears to nothing in seconds. Nose: This one noses like a true English Ale. Hoppy and yeasty with toasted malty aromas and also smells quite bitter. Palate: Wow... Same creamy taste and texture for a starter but right after it delivers beautiful green apple, honey and malty notes covered with mild eastern spices like nutmeg, cardamom, cinnamon and turmeric. Yeasty, grassy and woody with a good amount of vanilla. It reminded me Lowlands Scotch whiskies like Bladnoch and Rosebank. Overall: Definitely my kind of a beer. Sippable, malty and hoppy. A true winner... Don't let it get warm in the glass though. Anyway, I should get some more to keep in the refrigerator. I am pretty impressed with both beers from St. Peter's brewery I tasted today. I have to admit that I was feeling a little distant at the beginning because of the incredibly hip and over designed image of the brewery but the beer is amazingly good. Highly recommended... I am looking forward to taste different expressions in near future.